Mobile devices are growing ever more common, in this article we consider what is the best VPN for android. The Android system for smartphones appears to have been around for an age and more and most are surprised to learn that even though the green robot has been perma-etched in our brains for as long as we can remember is has only been available to the public since it was released in 2008. That said Android now dominates the smartphone and tablet market and in the third quarter of 2013 accounted for up to 81% of smartphone devices shipped. No doubt by searching out this article you’re an Android user and with such a high percent so are many others. You are also obviously interested in a VPN for your device. One of the most confusing aspects of attempting to choose a VPN provider that would be ideal for your Android device is considering what is the best VPN for Android? This can be a hard call to make and incorporates and range of aspects that are essential to consider in preparation for deciding which is suitable for your personal needs. Firstly and one of the main considerations when choosing a VPN for your Android device is your location and the location of servers that are available from the VPN provider. It is all well and good paying a great price but if you’re located in the US and the provider only offers servers in Asia or you’re sat in Australia when the bulk of servers are in Europe then this will lead to poor results and slow access. What most articles don’t tell you is this should be the initial consideration before anything else and before we even start to think about the practical details of what works best for Android. Our lives are ever more mobile and it is a fact of society today that your mobile device, be it a tablet or mobile phone is likely to be the one device that you will carry with you at all times, this includes on business and also on vacations or holidays. Due to this as well as a good local location having a range of country locations that you’re likely to visit in the future can be a big bonus. In our range of suggestions we’ve tried to take the best VPN service for Android and portion that down to access countries, this will help you make an informed buying decision regardless of where you’re located in the world. The second consideration is software. Carrying out tasks on an Android device mainly relates to apps and although it is possible to download OpenVPN for Android at the Play Store and add configuration files this for the new user can be confusing, time consuming and add extra legwork that just isn’t necessary. Luckily due to the huge market share that Android now enjoys many VPN providers such as IPVanish and ExpressVPN have started to release custom VPN apps that offer simple connection solutions, usually allowing connection within one or two touches of the screen. For the purpose of ease and also the extra features that some of these apps provide we would definitely recommend you consider a provider that has a custom Android app available, a good example of which is provided by IPVanish. Based on our two main important considerations we would consider the following providers most suitable for use with Android, all of which we have personally tested from a service and application point of view in our provider VPN reviews section. The Android application from IPVanish is the easiest to use and through the simple interface it allows access to their range of servers. It isn’t bogged down with bells and whistles and concentrates getting you connected and secure with ease and is one of the reasons why I rate it my favourite Android VPN app. The Android app has been regularly updated in recent years and includes features that help you find the fastest server and the most underused resource wise helping you get the best mobile VPN experience. The app allows you to sort by country, speed and load usage making it the fastest Android VPN app to get you connected to the server you want. No messing, no fuss and my number one choice for an Android VPN app. ExpressVPN offers a good solution to Android VPN connectivity. The interface is nicely laid out and easy to navigate. There are a few additional features such as the ability to select the protocol and while this is likely to be useful for the advanced user it makes it slightly more difficult for the novice. If you’re new to VPN use and just want to connect with minimal fuss then I still recommend IPVanish however if you want to tinker under the hood a little and don’t mind getting your hands dirty then ExpressVPN are a viable option. The ExpressVPN Android app allows you to ping the various servers which returns their speed. This allows you to find the fastest and keep updated if you want to change servers at any point. Overall I found the VPN Android app from ExpressVPN easy to use with some advanced features. If you’re after simplicity then I would still recommend you check out the IPVanish Android app but failing that then ExpressVPN makes a good second choice. The app provided by Golden Frog, the parent company of VyprVPN is one of the most aesthetically pleasing. I found it to be thoroughly professional in polish and has been built to be a seamless extension of their desktop client. This is great from a user point of view as if you take a VPN package with them not only can you make use of the Android application but the progression from desktop to phone and back again is an easy one to make due to the appearance similarities. The main screen features a simple one touch connection button with further access to the server selection. 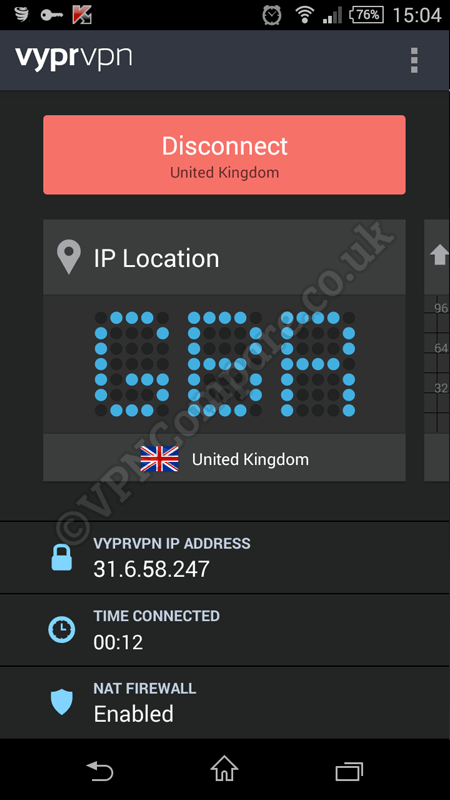 Other details such as your current IP address are visible. Swiping the middle sections brings up a speed graph and swiping again the ability to view connection logs. There aren’t too many options on the VyprVPN Android app which is good in one sense but not so good in others. Firstly it isn’t confusing to use but having the server speeds tucked away in a separate location requires a few more clicks than an app like the one from IPVanish meaning it’s just ever so slightly more difficult to use. One of the more interesting features of the app is the contrasting colour change when connected to a server from a completely white background to a black background, visually indicating your connection status. VyprVPN offer a good app but their speeds are slower than IPVanish meaning if you’re streaming video or using your phone or tablet a lot then you could be left disappointed. Final areas to consider include how many simultaneous devices you can have connected at one time, the more available the better for the whole family to make use of. It is also important to consider if you want to take advantage of using the VPN connection on your computer as well as this can open up a wide range of possibilities. With developments ever moving this article may be updated from time to time. If you’ve seen any fantastic features in a VPN providers Android App or you get stuck then feel free to post in the comments as we would love to hear your thoughts. I hope this article has helped you decide which is the best VPN for Android and will ultimately aid you in your purchasing decision.